A public opinion survey has found that 83 percent of Los Angeles’ citizens support the city’s hosting of the 2028 Olympic and Paralympic Games. The survey, accessible here, was conducted last month by the Thomas and Dorothy Leavey Center for the Study of Los Angeles at Loyola Marymount University (LMU). It came prior to news on Monday (July 31) that the Los Angeles Bid Committee had announced its intention to host the 2028 Games, meaning Paris will stage the event in 2024 and that the International Olympic Committee (IOC) would advance funds to support Los Angeles 2028’s $160 million investment in youth sports programs in the years leading up to the Games. An LMU survey from February of last year found that 88 percent of Angelenos supported Los Angeles hosting the 2024 Games. “This new LMU poll shows Angelenos are excited to bring the Olympics back in 2028,” Los Angeles 2028 chairman Casey Wasserman said. 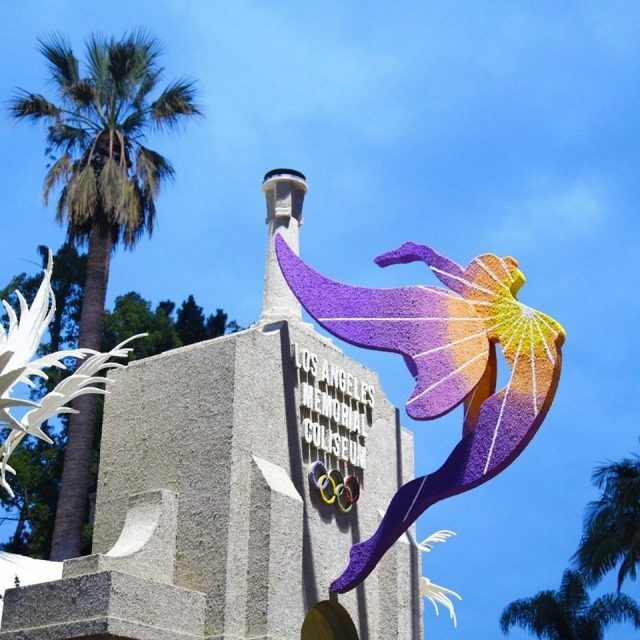 “LA already has a proven Olympic legacy from the 1984 Games. “That’s why it’s easy to believe in and support our 2028 plan – low risk and ready to go. “LA 2028’s support remains strong across all demographic groups and our Games will benefit all communities. The survey was funded by Los Angeles 2024, the LA Area Chamber of Commerce and Loyola Marymount University. “On Monday (July 31), Mayor Eric Garcetti made a once in a generation announcement – the Summer Olympic and Paralympic Games are coming back to Los Angeles for the third time,” Gary Toebben, the Los Angeles Area Chamber of Commerce President and chief executive, said. “Thanks to the determination and creativity of the Mayor and local Olympic leadership, Los Angeles has solidified an agreement with the International Olympic Committee to stage the 2028 Games. “The Chamber proudly partnered with LA 2028 and the Thomas and Dorothy Leavey Center for the Study of Los Angeles at Loyola Marymount University to commission a survey of Los Angeles residents’ opinion on holding the 2028 Games. “An overwhelming majority, 83 percent, want Los Angeles to host, with 54 percent in ‘strong’ support. Los Angeles 2028 are due to deliver a presentation on hosting the Games during a special meeting entitled “Ad Hoc on the 2024 Summer Olympics Committee” at Van Nuys City Hall on Friday (August 4). Chief legislative analyst Sharon Tso, City administrative officer Richard Llewellyn and City Attorney Mike Feuer are all set to report at the meeting. Tso told the Los Angeles Times the City Council will also have to sign off a new Memorandum of Understanding with the Los Angeles Bid Committee. That agreement will lay out the city’s relationship with Los Angeles 2028 and the yet-to-be-formed Organizing Committee that will run the Games. Council members scheduled to be present at the meeting are chair Herb Wesson, Gilbert Cedillo, Paul Krekorian, Bob Blumenfield, Joe Buscaino, Mitch O’Farrell and Curren Price. The city leaders say they expect to vote on the Host City Contract by late next week.